Metal Gear Solid V: The Phantom Pain is probably my least favourite entry to Kojima Productions’ venerable action series. There are many reasons for this, from its repetitive mission design to the fragmented, poorly paced story, but it’s the character of Quiet who stands out amongst the games’ many flaws. A crack sniper who joins up with Snake as a mission support member, Quiet is the latest in a long line of female Metal Gear characters whose visual design is meant, first and foremost, to titillate players. Although her missions take her across the sun-scorched mountains of Afghanistan to the forests of Angola, Quiet wears a bikini top, leather thong, and ripped-up fishnet leggings. The plot attempts to rationalize this by explaining that she is only kept alive following horrible injuries by having parasites covering her skin. These parasites absorb life-giving nutrients from the water and the sun. Quiet can only continue to exist by wearing as little as possible. If this sounds ridiculous, it’s because it’s some of the game’s poorest writing. Though Metal Gear games are full of unbelievable science and absurd characters, the excuse for Quiet’s lack of clothes is something else. It’s the sort of anguished, reaching plot explanation that must have been constructed after having already agreed to her visual design, not the other way around. And if it isn’t—if Kojima Productions truly believed that Quiet’s back story was clever—the effort is still undermined by the way every scene she stars in features a leering camera, less focused on her emotional expressions than her body. What’s most disappointing isn’t The Phantom Pain’s shoddy writing or creepy visual framing—it’s knowing that a few simple changes could have made Quiet a far better character. Previous Metal Gear games have featured characters with similarly sexualized design. From Metal Gear Solid’s Sniper Wolf to Snake Eater’s EVA and Guns of the Patriots’ rendition of Dr. Naomi Hunter, the series has long been known for keeping the women of its cast in various states of undress. All the same, these characters had a depth that compensated for their plunging necklines and the camera’s tendency to linger on their bodies far longer than their male counterparts. Eva may keep her jacket unzipped to her navel, but she’s meant to be seducing Snake throughout the story. (This excuse does wear thin as it’s repeated in Guns of the Patriots, where Naomi is turned into an undercover femme fatale, too). More important than plot rationale, these characters also possessed agency. They had complex motivations and spent the game making constant decisions of their own accord, free of the player’s control. They held power on the same level as—and independent of—the game’s men. Quiet, despite the complicated loyalties she displays at the end of her character arc, is different. She follows the tradition of Guns of the Patriots’ Beauty and the Beast Corps. : a group of antagonist pin-up models, only humanized through radio calls describing their back stories after they’d been defeated. 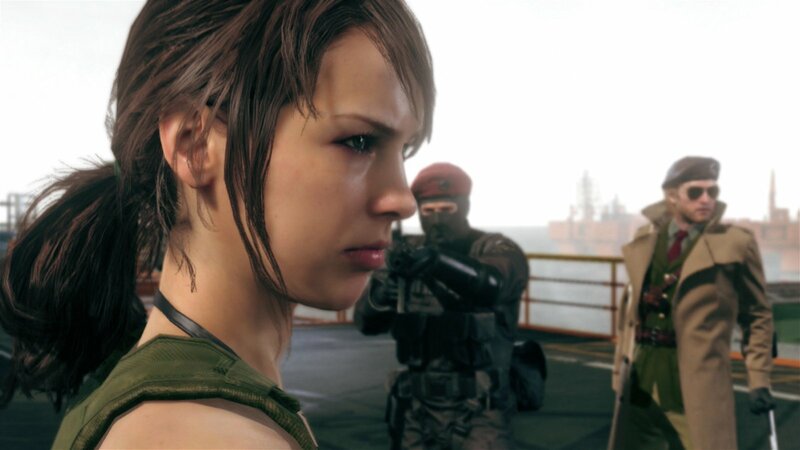 Like them, Quiet is largely free of personality. She gains some autonomy during her final story moments, but she’s largely positioned as another of Snake’s tactical tools. Along with an obedient dog and horse (and a robotic combat vehicle), Quiet is deployed as a support member on missions. She is ordered to snipe targets on command. Her very character keeps her from making her own decisions and, when she does act on her own free will, she is punished with imprisonment, sexual assault, and, finally, a presumed death. If Quiet was given more of a voice (excuse the pun) in her own story, this wouldn’t be an issue. The plot could allow her to wear her barely-there outfit because it’s her choice to wear it. She could refuse the occasional order issued to her by Snake in the field. Or, better yet, she could be positioned next to another man in the line-up of mission support members, to break the association with one of the game’s only women being regarded as an equal with only pets and a robot. A few small narrative changes would have allowed Kojima Productions to keep their character—and her design—without the regressive tone. As it is, Quiet is just another unfortunate misstep that adds up to make all of The Phantom Pain such a flawed end to the Metal Gear Solid series.